So after a year of trouble free ownership including a trip to the south of France, I went into the garage yesterday and noticed the o/s/r sitting very low as shown in the photo - I’m guessing it’s the common issue of a broken spring as it’s only the one side, but strange it often happens when the car isn’t being driven. 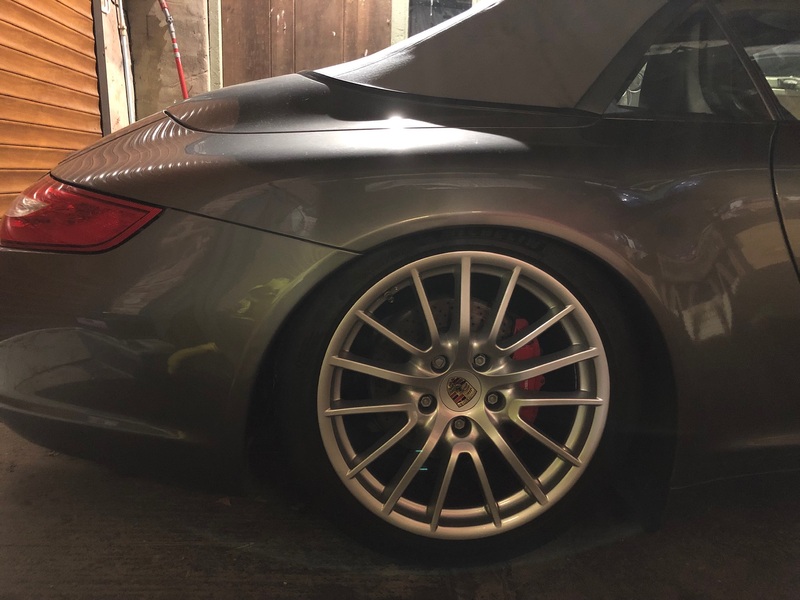 1) Although I’ve just missed the bulk buy, I could get Techart springs rather than OEM and have it sit a bit lower, but do they give a harsher ride? 2) As it’s not my daily and I’m in no rush, I’m thinking of changing them myself at home. The car has PASM, so is it a relatively straight forward procedure or best avoided? Any tips or pointers? (I don’t have a repair manual but do have spring compressors, impact wrench, etc). I realise the geometry will also need to be rechecked afterwards. 3) given the car has high mileage is it recommended to also change the dampers at the same time? If so, should I get Bilstein B4 or B6 (I want to retain the PASM) and are there any other parts also required? All experience and opinions welcome! Putting springs on from the likes of techart, H&R or Eibach won't charge the ride quality at all , you really won't notice the change from stock , but the handling and stance are a huge improvement. as for DIY only you know your skill level and confidence to take it on but lots do it DIY. cant comment on your other questions sorry. 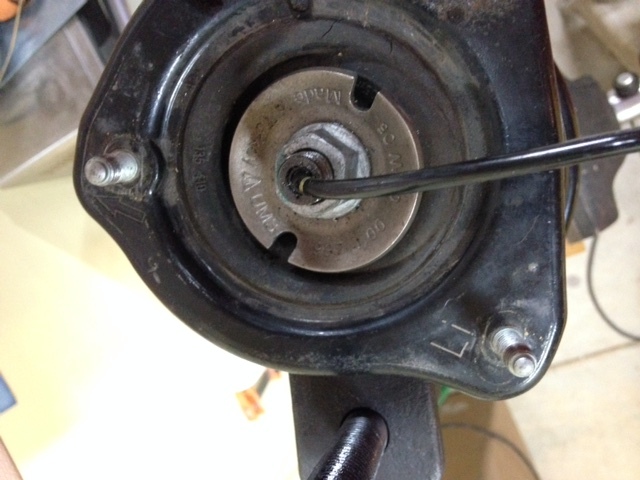 If you have PASM and are doing it DIY it helps massively if you have a vice to hold the top washer on the strut assembly while undoing the top nut. The washer has 2 slots in it for a special tool to hold it but a vice works just as well. The rest is pretty simple, A large ball joint splitter is also helpful. Thanks for the responses chaps. Just the kind of advice I was looking for thanks Rojdog! I’ve done a few classic restorations so ok with a set of spanners, just didn’t want to strip it all down and halfway through find it’s not a DIY job & specialist tools are required. 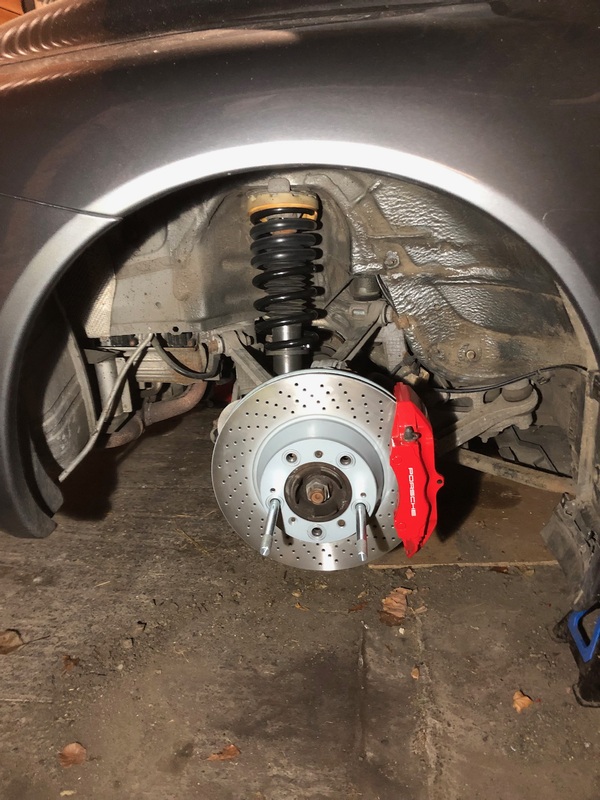 Just in case anybody is in two minds about fitting new dampers and/or springs themselves, I’ve finished the rears and it’s not a difficult task. Spring compressors are needed and having an impact gun no doubt helped, and although the ball joint on one side came apart with the tap of a hammer, the n/s wouldn’t budge so I had to get a heavy duty ball joint splitter. Everything else was fairly straight forward. The big advantage of doing the work myself was I wanted to remove the wheel arch linings to clean behind and check/clean the drains, check condition of all the bushes, drop links etc, and replace all the disks and brake pads at the same time. What I did find after removing the disks was one of the handbrake shoe linings was coming away from the shoe on one side, and had a big crack across it on the other hub so they had to be replaced. This was a b**ch of a job because of the tension in the springs and included a fair bit of swearing, definitely the most difficult part of the job for me. I’m sure it shouldn’t be that difficult with the right tools / technique! I’ve had a brake shoe lining come adrift on a previous car and it jammed and caused the wheel hub to lock up, so it was worth the skinned knuckles to replace these. I ended up getting 20mm lower Eibach springs mainly due to availability and kept the original PASM dampers, so I’m hoping when I get the alignment done it can all be set within the limits. It’ll be interesting to see the stance once I’ve completed the fronts and got it back on its wheels. Nice job. That would have been an unpleasant and unexpected bill from a garage. I wouldn't worry about the dampers unless you've done mega-mileage, as I don't recall too many threads about failed, leaking or damaged dampers. The OE springs on the other hand do tend to fail (a bit too much in my view). Mine did, at around 35,000km, and the OPC warranty wasn't any use (in Dubai they regard springs as a wear item due to the speed bumps and the speed most people take them). Anyway, I've now switched to H&Rs and I like the slightly firmer ride and improved body control. And I still have some 'as new' OE front springs in the shed but they're presumably worthless given their quality. I still have some 'as new' OE front springs in the shed but they're presumably worthless given their quality. Yes this was the reason I decided to go aftermarket, the more I looked into it the more common the problem with the OEM springs seemed to be. it was probably the cold weather that made them finally give in as there is normally a few thread around this time of year with snapped springs. When you tackle the front allow more time as its quite a bit more involved than the rear and as you have a 4s you will also has to free the drive shaft to get the shock out of the arch, it might be easier if you loosen the nut before lifting the car but as you have a impact wrench it should come undone if lifted but you will have to lock the hub to stop it spinning. Also you might want to see if you can borrow a torque wrench that goes over 300 ft-lbs as the nut will need tightening over this i can't remember the exact setting but its about 340 ft-lbs or bl**dy tight.